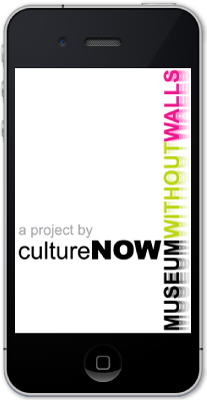 cultureNOW has partnered with more than 70 cities throughout America to showcase their cultural assets in a new way. The app is really a portable version of the website. Everything you can find on the web comes virtually into your iPhone. You can listen to all the podcasts, access the videos, search the content, find an event and take the tours the same way on your smartphone as you do online. Not only can you search by name, but the sites, podcasts and events that are near you will find you. Every day we highlight something different about the ever evolving collection: sites that are interesting, art just installed, special events. The list constantly changes. Our offerings are constantly evolving, so expect instant updates with new listings, photos, podcasts, and tour itineraries. If you've ever wondered about that sculpture, mosaic or building you pass everyday on your trip to work, this app gives you a chance to find out more about it. The app was voted NEW YORK'S BEST CULTURAL APP OF 2011 (a winner of the NY Big Apps 2.0 competition). In 2012 the American Institute of Architects honored it with a NATIONAL COLLABORATIVE ACHIEVEMENT AWARD.